I’ve been waiting a long time for something like this. Tablo currently makes one of the best OTA (over-air) DVRs available today. However, they just upped their game with an app that will turn your Nvidia Shield streaming device into a fully functioning DVR. Tablo ENGINE DVR is an app that lets you record, organize, and watch live TV without having to buy DVR hardware. It currently works with the Nvidia Shield streaming device. The only other piece of hard where it requires is a compatible USB tuner that you plug into your Nvidia Shield. Then you simply plug your TV antenna into the USB tuner and use the Tablo ENGINE DVR App to manage your recordings. Below is a diagram from Tablo’s Website. More on their app here. There are currently two USB tuners on the market that work with the Tablo ENGINE DVR. Tablo makes a Tablo Tuner Adapter that allows you 2 feeds from your antenna. Therefore, you can watch a TV show live while recording one on another channel. You can also record 2 shows on different channels if you aren’t watching live TV. The other tuner is the HAUPPAUGE WinTV-DualHD. It also allows 2 feeds from your TV antenna for watching and recording TV Shows. You will have the same features regardless of which tuner you use. However, I would bet the Tablo tuner was designed to work with the Tablo ENGINE DVR app. The most important feature of any DVR solution is storage for your recordings. Since this is an app that leverages your Nvidia Shield, the amount of storage is dependent on the storage of you Nvidia Shield. Currently, the Shield offers models with 16GB and 500GB worth of storage. However, there are enough USB ports to increase storage with an external USB hard drive. While Nvidia Shield is currently the only streaming device that supports the Tablo ENGINE DVR app, they are planning to expand support to other devices in the future. Below is a list of other features you get when combining the Tablo ENGINE DVR app with the Nvidia Shield. Watch, pause, rewind and fast forward completed and in-progress recordings.Completed recordings will include fast forward preview thumbnails that make it easy to zip through commercials or find a specific point in your recording. Completed recordings will include fast forward preview thumbnails that make it easy to skip through commercials or find a specific point in the recorded TV show. 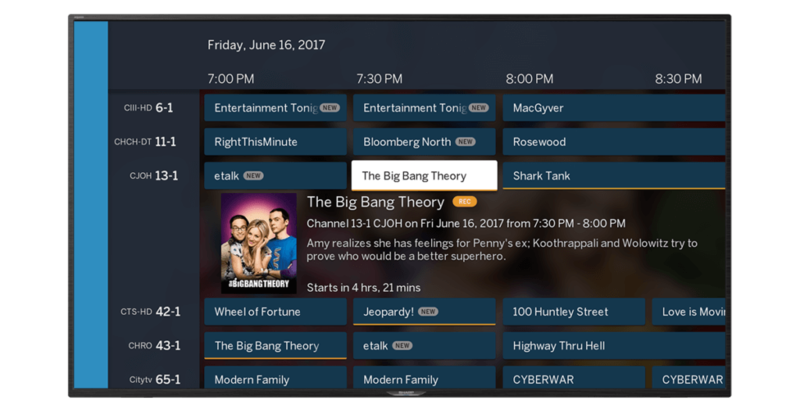 Browse and set recordings for shows airing over the next 14 days when you purchase a Tablo DVR Guide Subscription. Discover new shows and set one-click series recordings via the Netflix-style program guide views. Keep in mind that this solution is only recommended if you only want DVR functionality on a single TV. If you want multi-room DVR functionality, I recommend going with the Tablo OTA DVR. How Much Does Tablo ENGINE DVR Cost? The Tablo ENGINE DVR is free. However, if you want a real DVR experience you will need to subscribe to Tablo’s 14 day DVR guide. A Tablo guide subscription costs $3.99 USD/$4.99 CAD monthly or $39.99 USD/$49.99 annually. Otherwise, you will just have 24 hours of guide data to work with. This could make it difficult to schedule recordings in advance. You can sign up for the guide subscription by creating a Tablo Account.